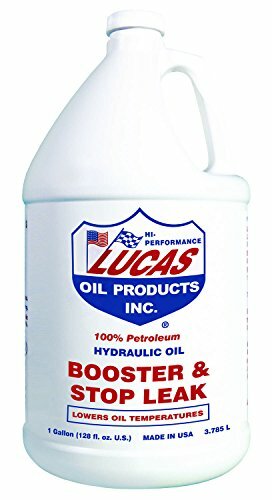 Lucas Oil Hydraulic Oil Booster and Stop Leak 1 gal Case of 4 P/N 10018-4 by Lucas Oil at Beaver County Collision. MPN: 4333059103. Hurry! Limited time offer. Offer valid only while supplies last. An additive for hydraulic systems that stops leaks and increases hydraulic pressure. Use in new units to stop initial wear and increase fluid life. An additive for hydraulic systems that stops leaks and increases hydraulic pressure. Use in new units to stop initial wear and increase fluid life. Lucas Hydraulic Oil Booster & Stop Leak was formulated to renew hydraulic fluid with an additive package that stops seal leaks, boosts pressure, reduces operating temperatures and increases the life of hoses, rams and cylinders. It is an inexpensive solution to most hydraulic problems and a perfect preventative maintenance product.